Li-Ning Badminton is one of the leading badminton equipment brands in the world. 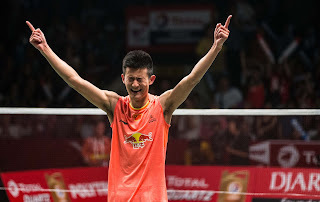 Li-Ning Badminton boasts international quality badminton products that are used by numerous top international badminton players including Olympic and World Champion Chen Long. Li-Ning is the official badminton equipment sponsor of the China National Badminton Team which is one of the strongest, if not the strongest badminton team that exists. The high profile of the China National Badminton Team has helped Li-Ning expand it's brand presence well beyond China into many major countries like the USA and Canada. The Li-Ning company has tremendous brand and marketing power and is anchored by thousands of domestic stores throughout China. The company sells and markets numerous sporting goods categories including basketball and running. The badminton equipment category is one of the largest categories due to the the popularity of badminton throughout Asia. It is said that there are over 200 million badminton enthusiasts in China alone. A Li-Ning retail store in China often includes numerous floors of expertly merchandised products with a team of knowledgeable associates to assist you with your Li-Ning sporting goods purchase. Li-Ning badminton equipment is sold through a carefully selected network of international distributors. Each distributor is responsible for purchasing and stocking domestic badminton products while marketing and selling them in their assigned territory. Li-Ning distributors work directly with their market specific athletes including national, regional and local level sponsorship's. If you live in the USA or Canada you can learn more about Li-Ning badminton sponsorships by visiting our official distributors web site.